After yesterday's single race, Principal Race Officer Peter Reggio coaxed the fleet out an hour earlier and succeeded in getting three races completed before returning to the Royal Malta Yacht Club's clubhouse early in the afternoon. The races saw crews severely challenged once again with almost all making costly errors, particularly with their gennaker handling, with a variety of hour glass wraps, broaches and costly trawling of sails. Nico Poons and his Charisma team put in another consistent day to win the RC44 Valletta Cup comfortably. Yesterday's leader Katusha did not race today, having retired due to a discrepancy with their crew classification. "It feels great," said Poons after dowsing his crew in victor's champagne. This is his first victory since joining the Class at the beginning of 2014. "Today was not that easy!" admitted the Monaco-based Dutchman. "There was quite a lot of wind, but it was fun, especially downwind. You had to concentrate so that you didn't flip which was difficult. Even upwind, going through the waves needed concentration." Poons' new tactician, Ray Davies, described the day: "It was fantastic yachting, but pretty ugly, especially on port tack offshore." To avoid the worst of the waves, all the boats typically took the left side of the race track all day. "It was a bit hairy at times in the gybes and a lot of boats were wiping out. It is very easy to broach these boats," continued Davies. Charisma's success, Davies confided, was due to them making less mistakes than their rivals. "Just aim for top fives and let people make mistakes around us. We have a fantastic team. We made two crew work mistakes the whole regatta. Other teams were making two each day. And Nico did a good job too." Davies beat his former Emirates Team New Zealand skipper into second place, Dean Barker calling the shots on board Vladimir Prosikhin's Team Nika, ending the regatta ten points adrift of Charisma. "It is a very good position, second in this fleet. When the fleet is so strong, it is an honour," said an ever modest Prosikhin. "The conditions were quite challenging this week, but the boat was fast and the crew solid. Today our boat handling was perfect until the last race, which was pity." After winning today's second race, Team Nika led into the leeward gate on race three only to trawl her kite. "I don't know what happened," admitted Prosikhin. "We lost positions, but fortunately we made a nice recovery." Team Nika was still able to salvage fifth. 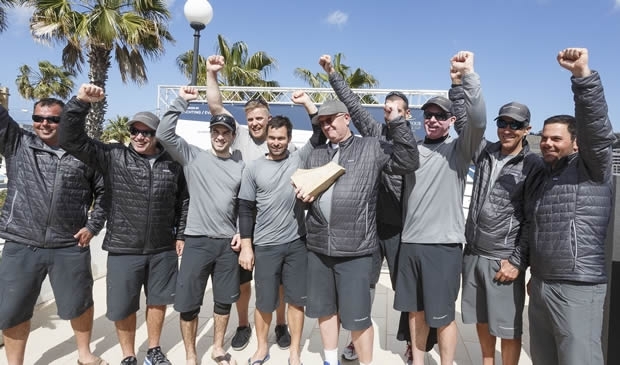 Vladimir Liubomirov and Bronenosec completed the RC44 Valletta Cup podium, finishing two points behind Team Nika. Liubomirov was pleased with his team's third place, but admitted making mistakes. A broken steering system had caused them to broach during the first race. In Russia Liubomirov is Commodore of the St Petersburg Yacht Club and was pleased that two yachts from his club – (Bronenosec and Team Nika) had made it to the podium. He added that they look forward to the RC44s returning to Malta. "We have to come back next year. It is one of the best places we have been to. The people are so friendly. The hospitality is at a very high level." If consistency was the key to the RC44 Valletta Cup, one team that suffered from a lack of this respect was Igor Lah's Team CEEREF. She won today's first race (adding to her two bullets on day one), but also scored several deep results over the four days, leaving the Slovenian RC44 fifth overall. Sweden's Richard Gorannson, taking over the helm of Chris Bake's Team Aqua made progressive improvement and today earned his first two podium finishes, leaving Team Aqua fourth overall, just two points from third. This regatta has been quite an initiation for Gorannson, sailing his first RC44 regatta but ably assisted by Kiwi tactician Cameron Appleton and the crew that is the current RC44 Tour Champion - Team Aqua was one of the few not to broach today. "We had well over 20 knots for quite some time but we kept the boat upright, which is not something everyone did," said Gorannson. "It is one of the first regattas I have been to where we have big conditions every day. These boats go really well downwind and it is so much fun to steer, especially when you have the small kite on because you are really on the edge. I was apprehensive about it at first, but now I am really hooked on it." The RC44s now decamp north ready for the Audi Porto Cervo Cup over 17th-21st June.